Buy Steam Wallet Codes for India and pay using Paytm, UPI or Net Banking. No credit card, registration or login required, and the code will be emailed to you immediately upon confirmation of your payment. It's the best way to top-up your Steam Wallet online without a credit card! 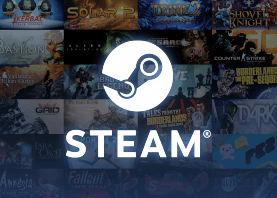 Buy Steam Wallet Codes online without a credit card! Purchase Steam Wallet codes to top-up your Steam Wallet in just 3 easy steps! Simply choose the voucher denomination that you want, the payment channel you wish to use, and then enter your email address. Complete the payment and your Steam Wallet Code will be automatically emailed to you. You can then redeem it on Steam.